When I bought my batteries I ordered 5 additional as spares. Rumor has it that the failure rate is about 1 in 30. 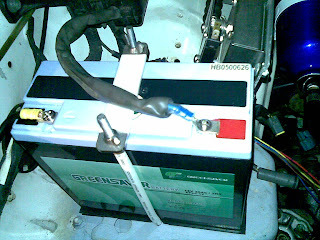 I have used one of the spares as the 12 volt battery for the accessories. To fasten it I bought some 6mm threaded rod (600mm zinc plated for $2 from Hardware and General) . I cut it to length and bent about 30mm on one end 90 degrees. The bent end goes through a 6mm hole drilled in the base where the original battery went. The battery is sitting on a rubber mat. The threaded rod and the hold down clamp are covered in heat shrink to prevent any possible abrasion.